You may recall Game Dev Story, a mobile game where you had to create and manage your own game company. It is still popular, but it has largely stayed unchanged since it arrived on the Play Store in 2010. 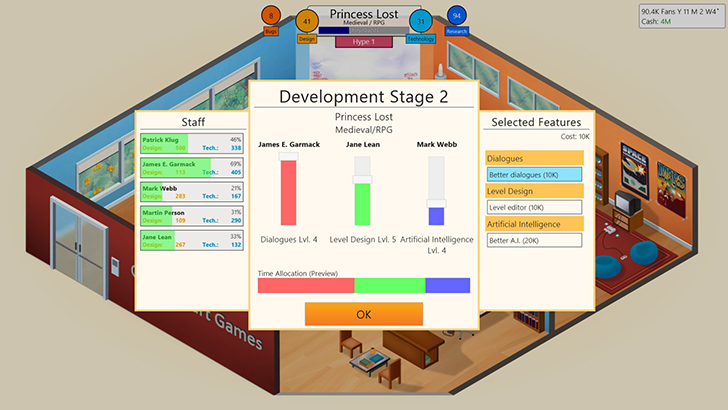 Game Dev Tycoon is a similar title, first released in 2012 for the PC and published on Steam in 2013. Greenheart Games, the studio behind the game, has announced that an Android version is coming in January 2018. In Game Dev Tycoon, you start out at the beginning of the video game industry in the 80s. You begin by designing simple games, and over time, you are able to research new technologies for your games (like 3D engines, better AI, improved sound, etc) as the industry evolves. As you collect more money, you can hire additional developers and grow your company. Every choice you make during game development matters. You can select from a variety of game consoles and platforms representative of the era you're in (for example, you start off with the PC and 'Govodore G64,' a parody of the Commodore 64). Every platform has its advantages and disadvantages, with certain genres performing better on specific consoles than others. As the game progresses, you can conduct advertising campaigns, target specific age ranges, develop your own game engines, and more. The Steam version works on Windows, Mac, and Linux, and currently has an average rating of 'Overwhelmingly Positive' out of 21,000 reviews. Personally, it's one of my favorite indie games. Not only did Greenheart Games just announce a major update, but the company also revealed that a mobile port is in development. The studio said that the iOS version will be released on November 28, followed by an Android release in January of 2018. But this isn't just a straight port; Greenheart Games has worked with Rarebyte to tailor the game to mobile. The mobile port will include an updated story line, new game topics, a new 'super-difficult' mode, built-in video recording and streaming, and a redesigned interface. The new content being made for the mobile version will arrive on the PC as a free update, but a release date was not provided.